Did you know that 74% of kids are considered obese? Our kids’ health is something we should not take lightly; a good health starts a home, by providing our kid's meals that are rich in vitamins and minerals. On the other hand, even if we prepare the most healthy and delicious dishes for the little ones of the house, in most cases they don’t end up eating it all. Kids love all types of junk food, sodas, chips, sweets which are not good since they do not contain any substantial nutrients for their body. 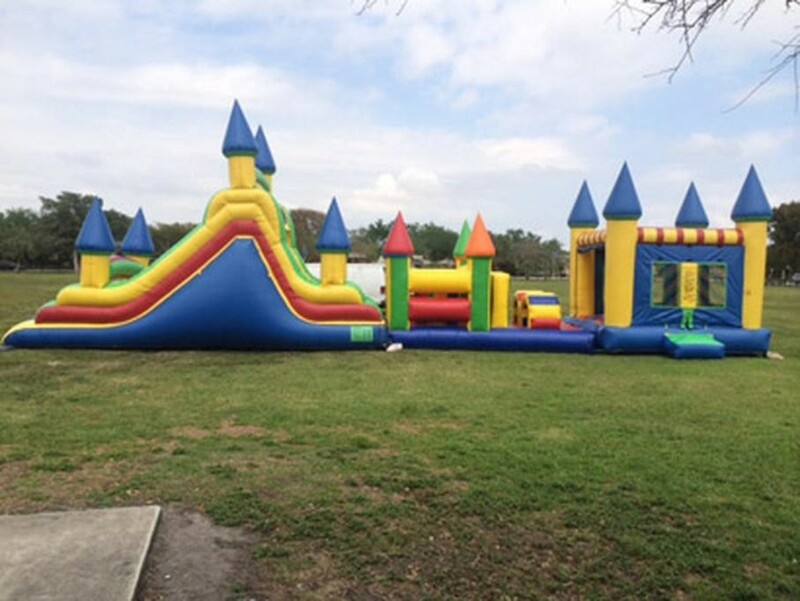 Also bounce house rentals Miami is a good idea for exercise when throwing a party but want to continue with an active lifestyle for the kids. Have you ever had to drag yourself into the gym after a long day? Sometimes exercising is no fun, is more like something we need to do to stay fit! Children probably have the same feeling toward the idea of exercise. The grand majority of kids have tons of energy and as parents, we should take advantage by helping them get fit and healthy. Exercises could be fun for a while, but after, kids will get really bored and finally quit. So today, we want to give you a terrific idea on how to motivate your kid to exercise while also having tons of fun! Yes, those two come hand and hand, if you get them an inflatable. This is a great addition to a fitness party day! You can either rent this bouncer at your favorite party rental for around $350 or you can buy it at any toy store. Kids will have tons of fun while doing a great work out. The gigantic 30 feet obstacle course allows your kids to climb walls and run, jump or bounce in the bouncing area to finally come out as a winner through the tunnel at the end. This bounce house is perfect for a competition between two people. Adding up some water to you fitness party day is not such a bad idea after all! You can get this toy at any children store, and the best thing is that it is at a convenient price. With this inflatable kids and adults can compete into winning the race by running or sliding across a 16 feet lane while getting all your body splashed! Put your kids climbing abilities to the test, with the rock climb wall slide inflatable your kids will be able to climb the rocky wall only to slide back to the start through the 12 feet long slide. This activity will allow your kids to use their muscles, potentially making them stronger; develop motor skills and burn calories while they have fun! To make it more competitive you can add a race track to the end of this slide! This cool inflatable will allow your kids with several opportunities for working out. The kid will be able to do some cardio as the bounce in the bounce area, also can do a little running competition with their friend at the obstacle course, do latter climbing or if they are into sports they can have a basketball match with the basketball hoop that is integrated. You can find a 5 in 1 bounce house in different themes such as Sports, Western and Race Cars. This sporty toy can be found at any party rental supply and it costs around $200 bucks to rent. This inflatable also provides multiple activities in one. Your kids can climb to the buccaneer cliff and slide down through the cannonball chute to the shallow pool area. And if you do not want to fill it up with water, you can always add some colored balls for them to play inside! Getting your kids into shape has never been easier and funnier, set up an inflatable and enjoy the sound of their laughter as they play their way through the daily exercise. The hardest part of this activity will be getting them inside!